Join us for Flux Thursday, our monthly potluck dinner and art salon, which is organized this month by Flux Artists-in-Residence, Ben Seretan and Gil Lopez. 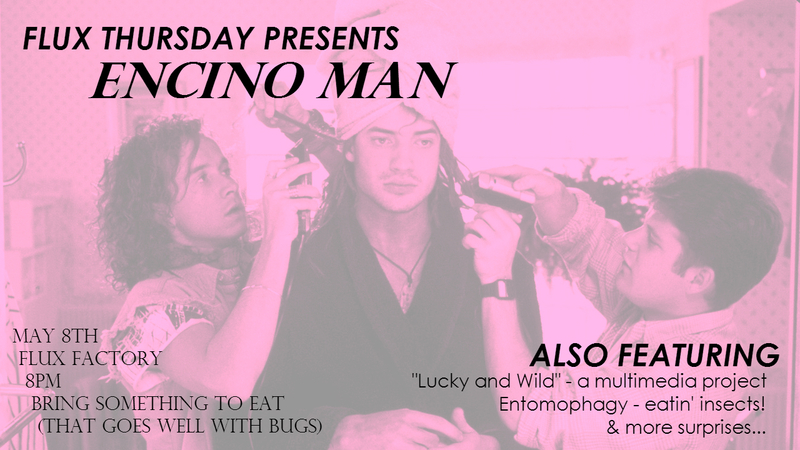 Entomophagy in theory and in practice, aka we’re gonna serve up some crickets and meal worms and eat ’em all up! Presented by Flux Artist-in-Residence Gil Lopez. A casual screening of Encino Man, the 1992 film that follows the story of two loser teenagers that discover a caveman preserved in ice in their southern California backyard. He awakes from his cryogenic freeze and wreaks havoc! Far less brilliant than either of the two Bill and Ted adventures, we’ll thaw this frozen primordial film from the dug-up backyard of culture. Maybe it’ll wreak some havoc, or just maybe we’ll become the coolest kids in school. Wheeze the juice! IFlux Factory is pleased to announce its next 2017 Major Exhibition, Tongue Tide. Inspired by Flux Factory’s location in Queens, NY -- the most language-dense area in the world-- Tongue Tide explores the multitude of ways in which artists engage with language, addressing both its tide-like ebb and flow as well as its limitations.